I'm a big fan of the job aid. A job aid is a quick-reference tool you can use to help you with tasks you do regularly, but not quite often enough that you could do them in your sleep. It's an easily accessible "how-to" that saves you from wasting time trying to remember how you did something the last time. Whether it's in the form of a diagram, a checklist or a single word jotted down on an index card it can make your life a heck of a lot easier. 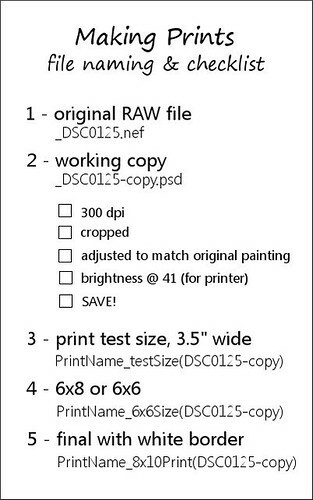 Tonight I was getting ready to prep another print for the online shop and couldn't remember the convoluted 5-filename printing system* I'd come up with the last time. I knew the system worked and I knew I'd scribbled it on the back of one of my daily planning cards. Now the next time I create prints for the shop all I'll have to do is bring up my checklist and work through the steps. No scratching my head, no re-thinking through the process, no trying to remember where I put my notes. * I came up with this 5-filename system when more than once I had to redo some work after having saved over something I shouldn't have saved over. I am open to suggestions for simplifying it if you have any! Is there a task you do regularly, but not often enough to do it in your sleep? Instead of wasting time trying to remember how you did it the last time each time it comes up, would it be useful to create an easily accessible quick-reference go-to guide?